In April 2012 the first issue of The Peace Journalist appeared. The developing field known as peace journalism is distinguished by editors and reporters making choices that improve the prospects for peace. These choices, including how to frame stories and carefully choosing which words are used, create an atmosphere conducive to peace and supportive of peace initiatives and peacemakers, without compromising the basic principles of good journalism. Peace journalism gives peacemakers a voice while making peace initiatives and non-violent solutions more visible and viable. 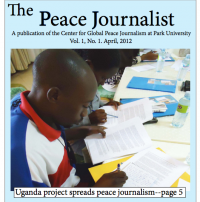 The Peace Journalist is a semi-annual publication of the Center for Global Peace Journalism at Park University in Parkville, Missouri. The Peace Journalist is dedicated to disseminating news and information for and about teachers, students, and practitioners of peace and conflict sensitive journalism. The current issue contains a wide range of articles, including an analysis of Gandhi as a peace journalist, how the media can promote religious tolerance, a peace journalist project in Uganda, a report on conflict and journalism in Afghanistan, and teaching conflict-sensitive journalism in Iraq. The next issue of The Peace Journalist will be published in October, 2012. It will highlight efforts to combat election violence in Kenya through peace journalism.